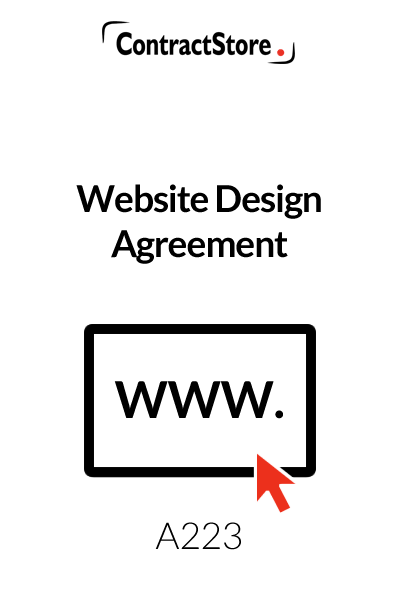 This agreement is intended for use by a website designer who is commissioned to design and develop a website for a client. There is a one page Form of Agreement, and four pages of Terms & Conditions and Schedules which details work to be done and specific payment terms. a general clause detailing the scope of the agreement, waiver and severability. Whilst reasonably balanced, the agreement is prepared from the website designer’s point of view rather than that of the client. 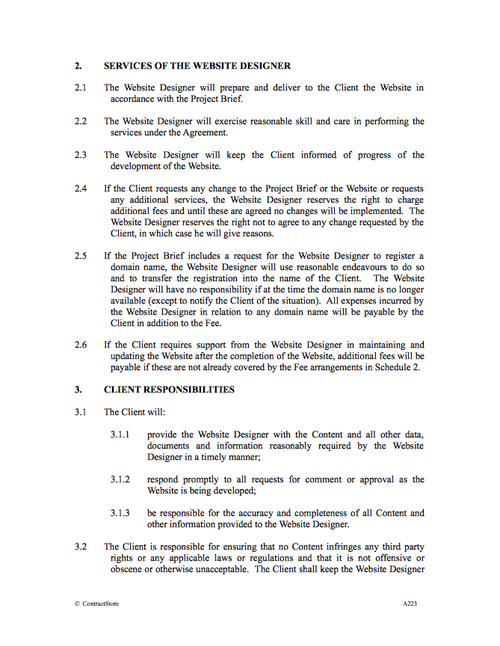 You need this document if you are a website designer wanting to detail the terms of your relationship with a client. This website design agreement is intended for use by a website designer who is commissioned to design and develop a website for a client. 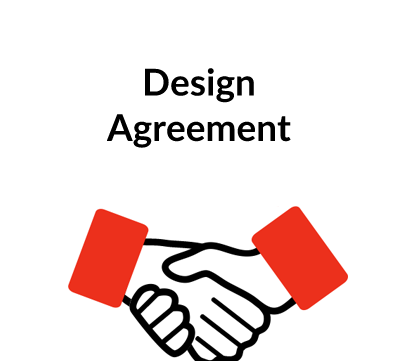 Whilst reasonably balanced, the agreement is prepared from the designer’s point of view rather than that of the client. 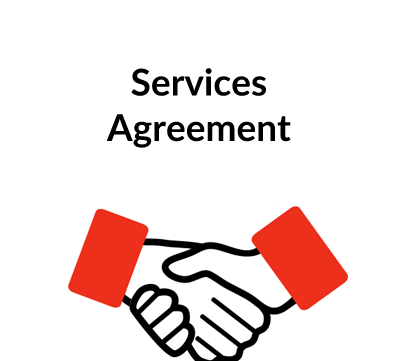 The agreement is made up of three separate documents – a Form of Agreement, Terms of Business and two Schedules, one of which has job-specific details relating to the work and the other sets out the fees and payment dates and deals with expenses. The document is designed for flexible use –the Terms of Business will be attached to the Form of Agreement when it is signed by the designer and client. The Terms of Business can also be used on their own without the Form of Agreement, and given to a potential client by the designer when being asked to tender for some work. The agreement is fairly straightforward. Comments on specific clauses are dealt with below. When it is signed – and there should be two copies, one signed by each party – the Terms of Business and the Schedules should be attached. The Schedules are important as they set out the detailed scope of work and fee arrangements and they need to be prepared with care. 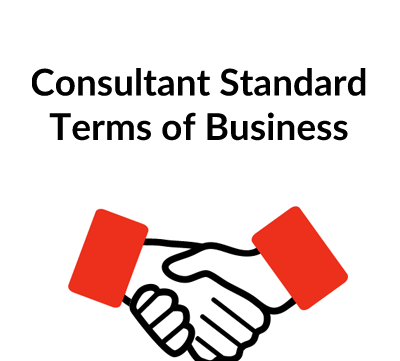 Generally, it is sensible in a relationship such as this for the designer and client to have a clear understanding before any contract is signed as to the scope of work that is required – this will help to avoid argument and clarify what is covered by the fee and what can be charged for as an extra. This clause contains a few defined terms which are used throughout the agreement. The project brief is to be included in a separate schedule which will form part of the agreement. This briefly describes the obligations of the designer. It also deals with changes to the project brief and the designer’s right to charge for these. Under 2.5 there is reference to the designer’s responsibility if registration of a domain name for the client is included in the project brief and this is intended to limit the risk for the designer. It is important in a project such as development of a website for the client to know what he has to provide. In this case the client is responsible for supplying content which the website designer will incorporate and for protecting the designer from any claims for copyright infringement by third parties. Also the client has a duty to respond promptly to enquiries – often a cause of delay by a client. This clause sets out a simple procedure for handover of the website to the client: any final tests can be mentioned in the project brief, if this is thought necessary. There will usually be a fixed fee, but that is not always the case. Occasionally the fee will be related to the time spent on the project and sometimes there will be a mixture – e.g. a fixed sum plus £X per hour/day if more than a budgeted amount of work has to be performed. Our wording assumes a fixed fee with 30% payable in advance and two further payments 30% part way through the work and 40% on completion. But other arrangements can be specified in the Form of Agreement and Schedule 2. The final paragraph 5.6 gives the designer the opportunity to charge for extra services. Where the designer has an hourly or daily rate, this will go into the Fee Schedule. Otherwise, the designer should provide an estimate before starting on any extra work. This clause gives ownership of copyright in the website design to the designer with the client having the right to use the completed website. Sometimes the client may require that copyright in the website is transferred to him in which case this clause would need to be changed. Copyright in content remains with the client. An important clause to protect the website designer from unlimited risk of claims. This clause makes the designer responsible for fixing any defects with the website for which he/she is responsible, but this obligation ends 30 days after completion. There is also a paragraph limiting the designer’s overall liability to an amount equal to the fee and an exclusion of any liability for indirect and consequential losses of the client. It is useful to have a clause which states that if an event beyond the designer’s control occurs, then he will not be liable and the agreement is suspended while the event continues. This includes flood, power failure, internet problems etc. Without such a clause if, say, the designer’s office burns down, he might face a claim from the client if he does not complete the work. Hopefully no disputes will arise, but it is sensible to specify the law of the country which governs the agreement – usually that of the country which both parties are resident – and also to say how disputes will be resolved if they do arise. Here we have suggested the possibility of mediation or with recourse to the Court as the final option. For more on mediation see our free document Z140. For information on CEDR, refer to their website – www.cedr.co.uk. The final clause contains three paragraphs of what lawyers call ‘boiler plate’ provisions – i.e. some standard wording designed to tidy up the agreement.